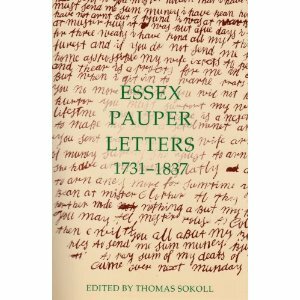 Anyone interested in pauper letters will come across Thomas Sokoll’s book Essex Pauper Letters, 1731-1837, published in 2001. An online review of the book came out in HistoricalSociolinguistics/Sociohistorical Linguistics two years later. But the book is also cited as important introductory reading on the topic “Letters to Parish Officials seeking Poor Relief”, on a website called London Lives 1690-1800 – Crime, Poverty and Social Policy in the Metropolis. The webpage reproduces an instance of such a letter, showing that the writer’s “letteracy”, as Tony Fairman calls it in an article on the subject, cannot have been very high. The letter has been transcribed on the website, and can be enlarged to make for detailed analysis. Fairman, Tony (2008). “Strike-throughs: What textual alterations can tell us about writers and their scripts, 1795-1835”. In: Marina Dossena and Ingrid Tieken-Boon van Ostade (eds. ), Studies in Late Modern English Correspondence. Bern etc. : Peter Lang. 193-212. This entry was posted in 18th-century letters, 19th-century letters and tagged London Lives, pauper letters, Sokoll. Bookmark the permalink.